NEWTOWN -- Jessica Rekos was remembered Tuesday as a smart 6-year-old girl who loved her siblings, wanted real cowboy boots for Christmas and ran as much of her world as she could manage. Those attending a memorial service for Jessica at St. Rose of Lima Church on Tuesday described it as a moving, beautiful event. "It was full of angels," said Bruce Blanchard, of New Milford, who was at the service that began under dark gray skies and ended in sunlight 90 minutes later. Jessica was one of the 20 children and six adults murdered at Sandy Hook Elementary School on Friday. The emotional highlight of the service was a eulogy delivered by Jessica's mother, Krista Rekos. Blanchard said Krista Rekos told the full church of her daughter's desire for cowboy boots this Christmas. He also said that Krista Rekos told the crowd that her daughter, even at 6, was, in effect, "the boss'' of the household. Krista Rekos is a sixth-grade teacher at the Blackham School in Bridgeport. Two of her former students, O'Brian Reynolds, 16, and Iman Doss, 17, both of Bridgeport attended the service. Afterward, Doss said their teacher told her classes several stories about her daughter. One of them involved the time when Jessica was throwing a tantrum and wouldn't stop. Krista decided to take away her daughter's shoes and put them in the basement. Jessica then proceeded to lock her mother in the basement. "It was a happy moment," Doss said. "Then she started talking about when she went to school that day and started crying." "She would always come to school and tell us stories about her daughter," Doss said. During the service, Jessica's cousin, Erin Lafferty, sang a tribute song and her aunt, Karla Lafferty, offered prayers. A grandfather, a family friend and Jessica's riding instructor were among the gift bearers during the service. Scores of teachers from Bridgeport and School Superintendent Paul Vallas attended the service. The service was one of five scheduled this week at St. Rose of Lima Church. Gov. Dannel P. Malloy attended, and a motorcycle guard of 14 police officers from seven departments escorted the funeral cortege to the church. Small white angels hung from the bare branches of a shrub outside the church. A bank of flowers, balloons and stuffed animals were on the ground below a shelf of candles. The church's bells tolled a single repetitive note throughout the morning. Access into the church was closely guarded by police. Yellow crime scene tape blocked entry to the church across its lawns. And yet, throughout the service, people asked permission simply to add to the growing bank of bouquets and teddy bears outside the church. "We just decided to come here," said Andrea Salcevo, of New Milford. 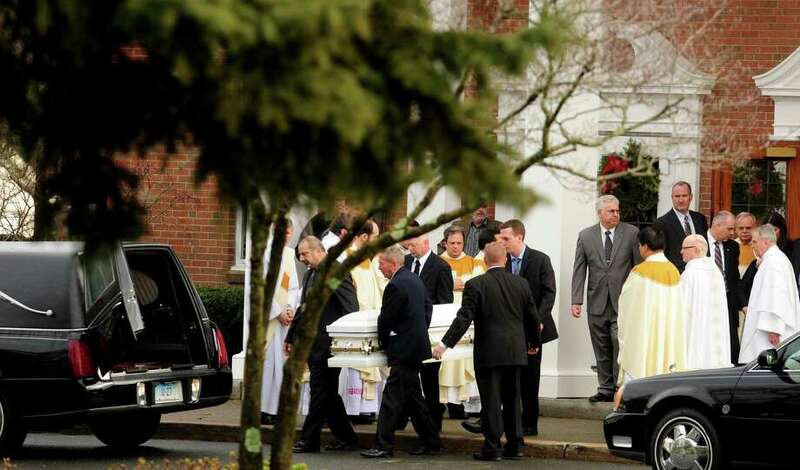 Tom O'Quinn drove to the church from New York to pay tribute to Jessica. Parking in front of it, he released a bouquet of helium balloons that soared up over the town into the gray sky. He also left a large sign saying "God Bless America ... The O'Quinn Family, Hermansville, Mississippi'' in front of the church. George and Radia Martino drove up from Howard's Beach in Queens, a neighborhood devastated by Hurricane Sandy. "We just came to express our solidarity with the people and the town," Martino said. "We wanted to express our sorrow." Staff writer Linda Lambeck contributed to this report.